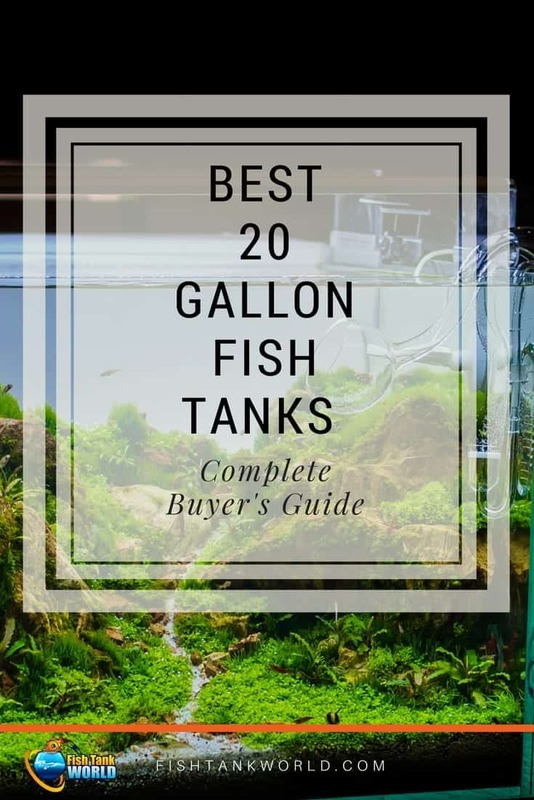 If your available space in your home or office allows only for a maximum 20 gallon aquarium, here is a buyer’s guide and the best 20 gallon fish tank reviews. 20 gallon is a good starter size for beginner or intermediate hobbyists. In particular, if you are a beginner, it is the smallest size we recommend to start with. You will have enough space to set up a pleasant fish community and maybe even add some live plants. A 20 gallon tank will provide you with ample capacity to explore and have fun with your new passion. 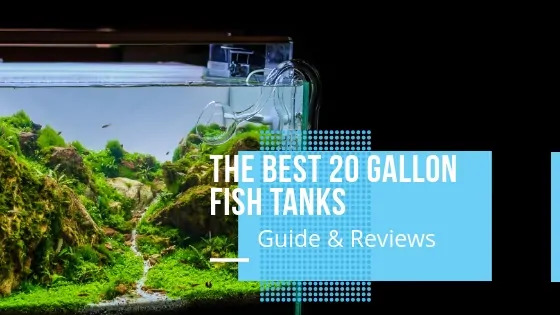 Let’s take a look at the top 20 gallon aquariums that are on the market today. We will help you make a well researched decision in order to avoid making any potential mistakes. The Marina LED Aquarium Kit is a glass tank that comes in an incredibly complete kit. This is a well known and trusted brand with aquarists world wide. The filter provided is a hang-on back power 3 stage filter that is very efficient for this size tank. The kit comes with a LED light incorporated into the canopy that mimics daylight light. It even comes with water conditioner, fish food, and a net. The only thing missing to get your started is a water heater. Depending on the fish you will be housing, you may or may not need a heater. The Aqueon LED 20 Aquarium starter kit includes everything you need to get you up and going with your new hobby. The tank is made of glass and is sturdy. It includes a LED light in the hood and also has a power 3 stage filter. The kit also comes with a heater and additives like fish food and water conditioner. The Tetra 20 Gallon Aquarium Kit is a great glass tank that also comes in an all-in-one kit. The kit contains an LED light attached to the hood with a daylight effect, a powerful whisper filter that is quiet, a water heater, fish food, and even some artificial plants. This brand is made in the USA and is well known and trusted in the aquarium world. The 20 gallon Marineland AMLPFK20B Biowheel Aquarium Kit with LED Light comes with everything you need to get started. The biowheel power filter is a superior filtration system and is trusted in the aquarists world. 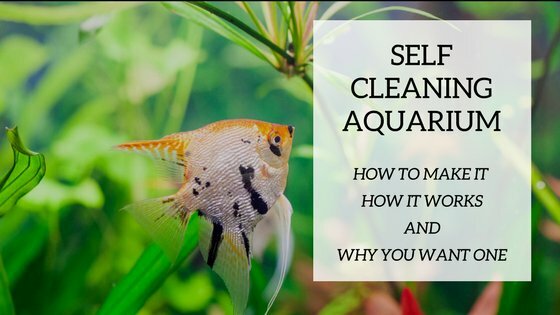 Before heading out to purchase your aquarium you need to take into account a few things like your lifestyle, your budget, your allowable space, and many more things. 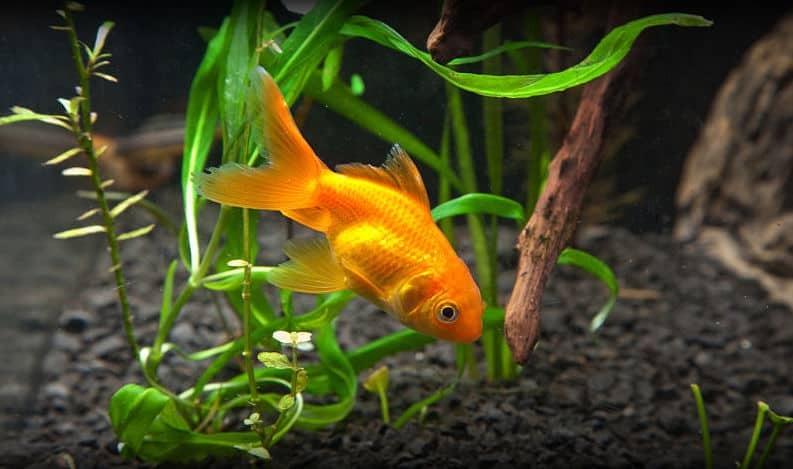 Here are a few things to look out for when choosing your 20 gallon aquarium. 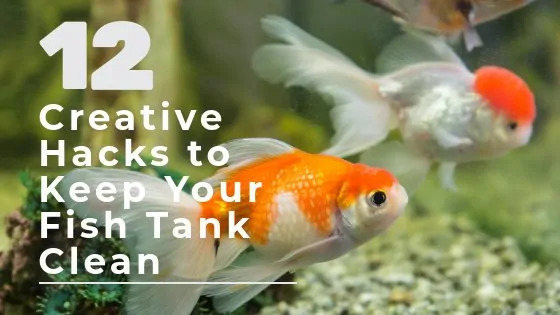 Choosing the location of your tank is the first thing to do. When you set up an aquarium, cycle it and get it running, you don’t want to be moving it afterwards if it not in an appropriate space. Actually, you will probably not be capable of moving it without partially emptying it. This can cause unnecessary stress on your fish and may cause your water levels to destabilise. That is why it is so important to choose the location wisely. Once set up with the fish, you want to make sure it’s in the perfect spot in your home or office. Choose a place that is not close to windows or any air vents because this may cause water temperature fluctuations and that doesn’t have too much passing traffic as you may put your tank in danger of an accident. Measure your chosen spot and make sure that you have enough space to put your 20 gallon aquarium, the stand, and its accessories all the while being able to reach around the tank to do maintenance and such. If you live in a small space, then the 20 gallon aquarium is a perfect choice as it will not overpower a small room. This article can help you to locate the perfect spot for your tank in your house or office. Of course you will want to establish a budget for your new hobby. Believe us, this is one hobby that can ruin a bank account if you are not wise in your purchases. Make sure to get the best bang from your bucks. Sometimes being patient and staying alert to promotions or specials can save you a few dollars and even provide the tank that you couldn’t afford otherwise. A 20 gallon aquarium kit should not cost you too much. We will show you some pretty affordable ones in our review. You will want to consider your lifestyle before purchasing accessories for your tank. Are you away from home a lot? Are you forgetful and think that you may neglect feeding times? If so, then you need to look into adding some extra accessories like an automatic feeder for example. If you want to know more on how to handle your fish while on holiday, check out this article. If you have prior aquarium keeping experience, then this will come in very handy when setting up a new aquarium. Use your research and your knowledge to purchase the best tank for your needs. If you did well with certain types of fish in another aquarium of a similar size, then you may want to repeat this combination in your new 20 gallon tank. If you choose to experiment with new kinds, do the necessary research in order to make sure that they are a suitable size for a 20 gallon aquarium at adult size. Purchasing a 20 gallon tank will limit you on the size and number of fish that you can add. You are better off adding communities of smaller fish that cohabitate well together than putting larger fish that will become crowded. Some all in one kits come with a water heater and others don’t. Check the types of fish you wish to have to see what temperature they do well in. Most tropical fish fair well in 78 degrees water. If you live in a cold climate, you will need the added heater and thermometer if it is not included in the kit you choose to purchase. You may want to look into adding live plants to your new 20 gallon tank as this always adds a natural feeling to the general look of your aquarium. Also, fish enjoy having spaces to play and hide in. A 20 gallon tank offers some room to add plants. We recommend you make sure that the plants are compatible with the fish communities you wish to establish. A 20 gallon tank is considered on the smaller side in the aquarist world. Some may consider it in the nano category, but we feel that this is a good minimum size for a starter tank and will provide enough variety and entertainment for many years. A 20 gallon tank is big enough to keep stable water levels and not have to worry too much about any water inconsistencies. The smaller the tank, the more difficult it is to keep water established. 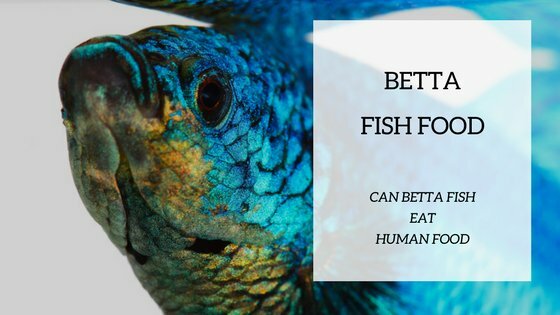 Small changes have a huge impact on the general health of the water, and thus the fish. A 20 gallon tank can be moved more easily than a larger volume tank. If you plan to move in the next year or so, then maybe this is a good option for you. We don’t think we need to provide too many explanations to prove that moving a 20 gallon tank is far less a hassle than moving a 150 gallon one. A 20 gallon aquarium is big enough to decorate and add accessories to without having it look too crowded. Check out this article for ideas on how to set up and stock a 20 gallon fish tank. 20 gallon tanks often come in all in one kits. These can be very handy when you are starting out. You will have no need to research every individual piece of fixture that you need to set-up your tank and get it going. These are tried and tested and will definitely help you to minimize the start-up mistakes so many hobbyists make in the beginning. These are always good points to look at. Is this a trusted aquarium company that has been around for many years? How is customer service should I have problems with anything in regards to my new aquarium? There are 2 main materials used to build aquariums: glass and acrylic. Acrylic will be clearer, stronger, and lighter, but may scratch more easily. A glass tank is sturdy, doesn’t scratch and can rest on a metal stand with only corner support, while an acrylic one will require a full bottom support. If you are looking into purchasing an all in one kit, then take a deep look at what’s inside the box. Make sure that you know what everything is for and make sure to purchase whatever is not included in the kit that you may need to get you started. It will most likely come with a filtration system, a lighting fixture, possibly a water heater and some decorations. All kits are not created equal, so shop wisely. One thing to keep in mind is that you should definitely make sure that the light provided in the kit is a LED. Some of these LED systems in the all in one 20 gallon aquarium kits offer only a daylight setting and others provide an added interesting nighttime moonlight blue light effect. Make sure you know what the LED settings are. The accessories that seem to be the ones that are omitted in some kits are the heater and thermometer. If you intend to keep tropical fish, then this is probably a crucial item that you will need to purchase separately. Make sure to know what temperature your fish communities will need. Try to stick to your budget. Shop around in local stores and online. Keep an eye out for promotions. It’s really easy to get carried away in this hobby and surpass your budget. It’s best to start with the minimum and build up the equipment as your experience and knowledge progresses. Should you make some errors and lose some fish during your learning curve, you will feel better if you haven’t invested too much money at the start-up period. You will see, as you gain experience, you will always be wanting to add things and change things in your aquarium. The all in one kits come with basic features and accessories, but as you acquire skill, you may want to upgrade some elements. The 20 gallon aquarium will need a sturdy stand to support the full tank, like this one that you can check out on Amazon. This size aquarium can’t sit on just any piece of furniture. Some come with the stand and others you will have to purchase separately. This is an important choice, as it will be a pat of your décor and you want it to blend and not clash with the rest of your furniture. Make sure to purchase a stand that will withstand the full weight of a 20-gallon aquarium. Any one of these kits will work great and provide you with hours of viewing pleasure. After you set up an all-in-one kit you can get creative and decorate it as you wish. As your hobby and knowledge expands over time, you can add embellishments and make your 20 gallon tank as personalized as you want. A 20 gallon tank is a great starter size for the beginner hobbyist. We feel like the Marina LED Aquarium Kit is the best one on the market today because it offers many features and accessories at a great price. It provides a LED light, an excellent filter, and many additions to get you up and going. Keep in mind that you will possibly need to purchase a heater and thermometer, but it is still a worthwhile purchase. It is very well liked and is a popular purchase for beginner hobbyists.